Blade construction: Shinogi-zukuri, Iori-mune, Mihaba on base is a bit on wider side standing firmly with Funbari and Shinogi-ridge is rather on higher side. There is appropriate degree of tapering from base to point holding deep waist pointed curvature as well as upper pointed curve in good proportion that leads to a medium tip Kissaki. 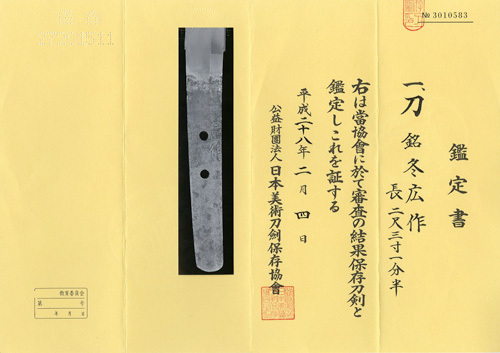 The entire blade creates in an archaic style of Tachi. Forging(Hada): Forging is conspicuous Itame-hada and Mokume with some indication of entwined flowing mark. The entire Hiraji surface is covered in speckled Ji-nie that generates reflecting irregular whitish Utsuri effect over the surface. 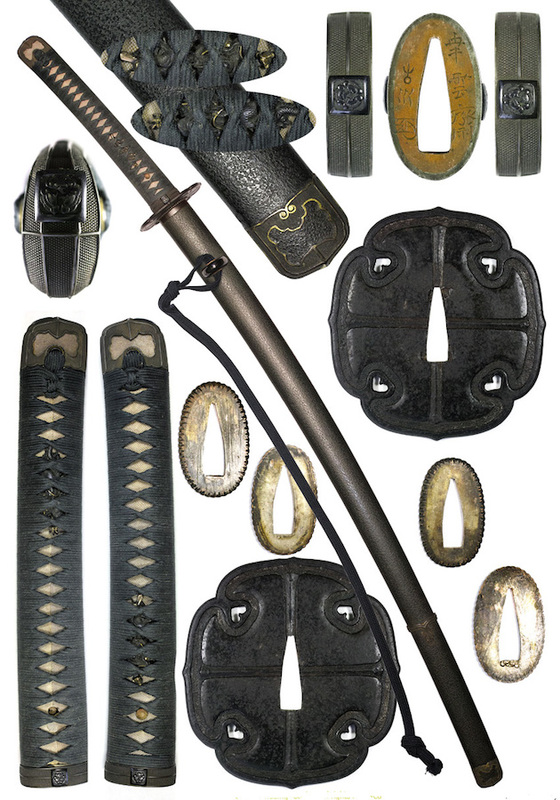 Temper(Hamon): Hamon is a bit on stronger side Nie hard metal granules base, shallow undulating NOTARE mixing in combined Gunome like a crab-claw and tassel-shaped Choji and Togari-ha quench pattern where works with rather on stronger side of sparkling Nie and deep Noi mist-like crystalline area. Some temper shows splash Tobiyaki over the surface and clear indication of YUBASHIRI-isolated patches of Ji-Nie indication. In the interior of temper, there works with isolated dots of YOU, generous activities of Nie such as frequent Sunagashi short line of Nie and some indication of threadlike area of Kinsen. Temper of tip(Boshi): Boshi forms irregular Midarekomi, medium circle deeply turns back. Arizona residents add sales tax.